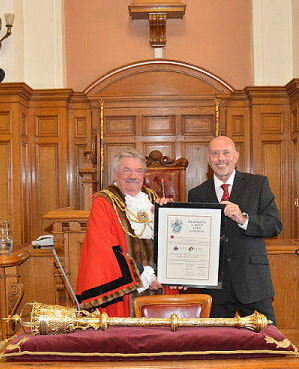 At a special meeting of the Brighton and Hove City Council this week, Olympic legend Steve Ovett MBE was made a Freeman of the City. 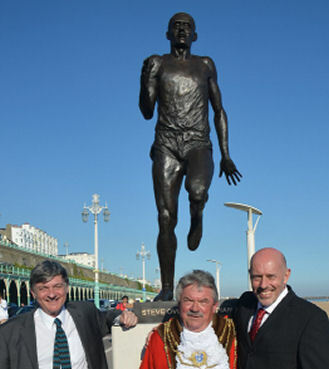 Afterwards Steve attended the unveiling of a statue of himself on Madeira Drive on the seafront. Also in attendance was the city’s oldest Olympic torch bearer, 87 year-old Sylvia Baker – who taught Steve at Balfour Juniors. Steve Ovett was born in Brighton and educated at Varndean School. He won the Gold Medal in the 800 metres at the 1980 Moscow Olympics and the bronze medal in the 1,500 metres. He was also a world record holder at 1,500 metres and the mile. The statue replaces one put up in Preston Park in 1997 and stolen 10 years later. The cost of the statue has been met by members of the Brighton and Hove business community.